More than 57 percent of single respondents in Shanghai say they have never dated, and 13 percent want to keep their single status forever, a survey reveals. Not every person wants to get married — indeed for some Shanghai singletons, it’s the last thing they want. More than 57 percent of unmarried respondents to a survey in Shanghai said they had never dated, and 13 percent said they wanted to keep their single status forever. The IT industry had the largest percentage of single men, 16.74 percent, said the survey by recruitment website Zhaopin.com, which was published yesterday. The survey interviewed 3,502 singles in Shanghai. Although 13 percent of respondents said they just wanted stay single, nearly 40 percent expressed an eagerness to bid farewell to their single status. Jessy Chen, a 34-year-old human resources worker, said she did not mind whether or not she found a partner. Chen has never dated and spends her spare time traveling, meeting friends and shopping. 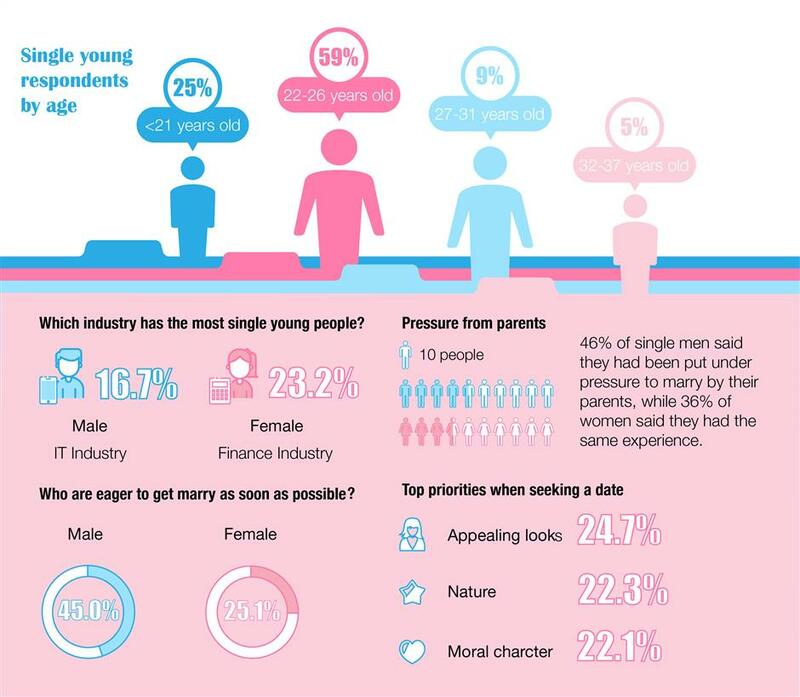 Looks, character, and moral quality were the top three criteria for single respondents on what they want from potential sweethearts, accounting for 24.7, 22.3 and 22 percent respectively, according to the survey. In total, 12 percent of those surveyed believed the reason for their single status was because they were “ugly,” while 24 percent of men among them still demanded any girlfriend should have a beautiful face. In total, 25 percent of singles born after 1990 said they put looks first, while 30 percent born after 1970 and 1980 gave moral quality the top priority. More than 40 percent of single men said they had been put under pressure to marry by their parents, while 36 percent of women said they had the same experience. The survey was released before qixi — the seventh day of the seventh month on the lunar calendar that is also known as Chinese Valentine’s Day, which falls on August 28 this year. Meanwhile, a report by China’s biggest dating website jiayuan.com revealed some qixi “nightmares” for singletons. Top of the list was meeting their ex on the street accompanied by their current boyfriend or girlfriend, being pressured to find a partner by their parents, and being surrounded by lovebirds during qixi.